This will be my first attempt at homemade pizza dough. Personal pizzas are great for most company because people can top their own with whatever they prefer. The folks eating here this weekend include someone who is dieting, someone who is a vegetarian and someone (me) who has food restrictions all of her own. Luckily, I didn’t have any gluten-free guests this time, so pizza was a great way to go. This recipe calls for using unbleached all-purpose flour, but I have some Anitmo Caputo 00 Pizza Flour I was sent by mistake when I ordered Semolina for making my own pasta. I decided to keep it and am glad to have it on hand for this. 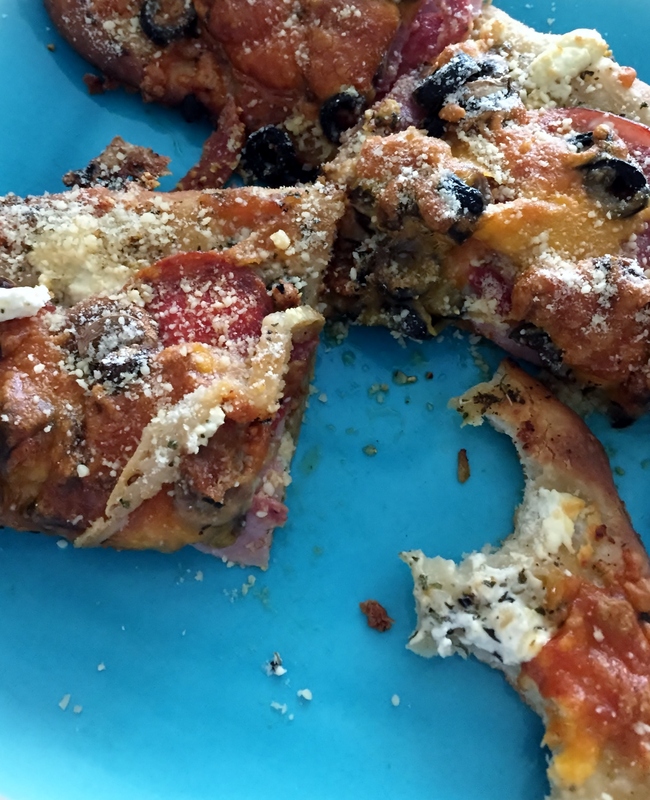 The ingredients for the pizza dough are 1 1/3 cups water, 1/4 cup olive oil, 3 1/2 cups Flour, 1 tablespoon sugar, 1 1/2 teaspoons salt and 2 1/2 teaspoons bread machine yeast. The recipe makes two thin 12- to 14- inch, one 14-inch deep dish, four 8-inch, six individuals or one 17 x 11 inch rectangular crust. I put everything into my bread machine and set it for the dough cycle. When the cycle completed, I removed the dough from the machine, separated it into 4 portions (I decided to make the four 8-inch pizzas,) and left the dough balls to rise on a slightly floured board for 30 minutes. At this point, the dough can be baked, refrigerated for up to 24-hours or frozen for up to 3-months. I set my oven to preheat to 500 degrees while we prepared our individual pizzas. After brushing the pans with oil and sprinkling with a little fine cornmeal, we were read to start building the pies. If you are adventurous and have good hand/eye coordination, I figure you can toss the dough like a professional pizza baker. We, however, know our limitations and slowly stretched the dough out, using our hands, atop the pans they would be baked on. For toppings, I provided canned pizza sauce, pesto (leftover Basil, Garlic, Pine Nut and Parmesan pesto from the sourdough pesto bread I made a couple days ago,) olive oil, caramelized garlic, mushrooms, black olives, bell peppers, tomatoes, onion, pepperoni, salami, Canadian bacon, shredded Mozzarella, Shredded Cheddar, Goat Cheese and Parmesan. We each built our pizzas and, because my oven isn’t quite big enough, baked Stacy’s before mine and Becky’s. When it was time to put the pizzas in the oven, I first reduced the oven temperature to 450 degrees. Then placed the pan in the oven to bake for 15-18 minutes. (Stacy’s was far thinner than mine or Becky’s, so I baked hers for 15 and ours for 18.) After coming out of the oven, we let them sit for a few minutes before cutting and eating. Stacy, tempted by the demon Pepperoni, decided to forgo her vegetarian leanings for a day. Thus the unhappy pepperoni face on her pizza. 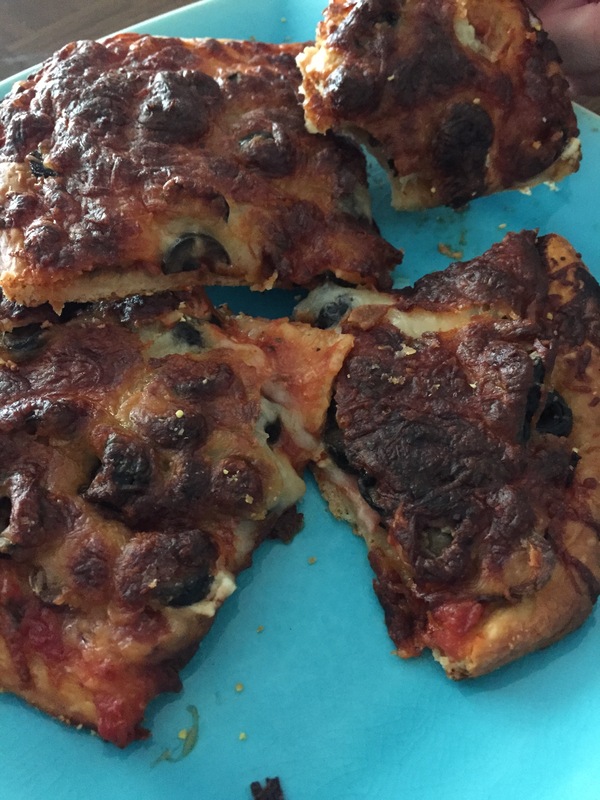 Becky is a full-on black olive nut, so hers was a black olive pizza with bits of other stuff thrown in. Because of my digestion issues, I cannot tolerate a lot of vegetables or some cheeses, like Mozzarella. My pie basically contained everything else. I also opted out of the standard pizza sauce, instead using leftover pesto. The pizzas were delicious. The crust had just the right combination of crunch and chew. The texture of the finished crust reminded me a little of the Indian Fry Bread that can be purchased at fairs and food festivals. 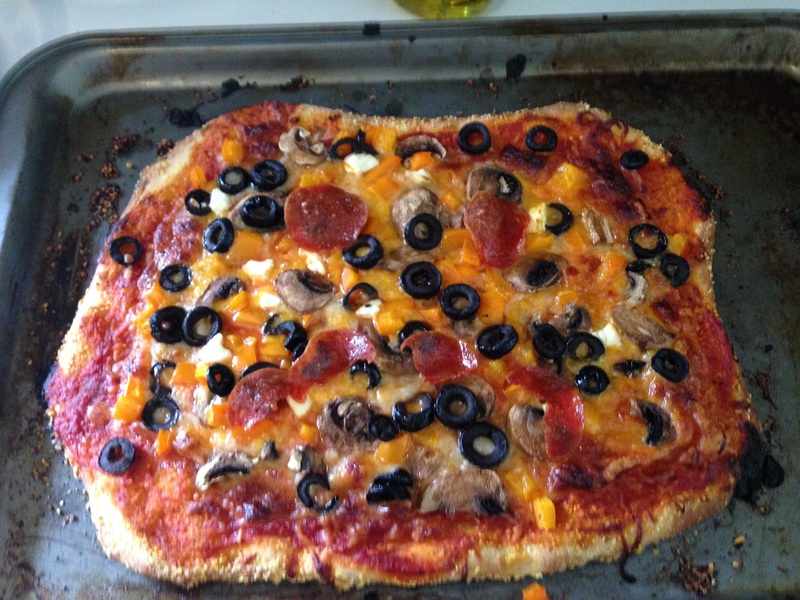 I am looking forward to trying more homemade pizzas in the future.